I did these forever ago and I am just now getting to posting them - this summer has been insane! 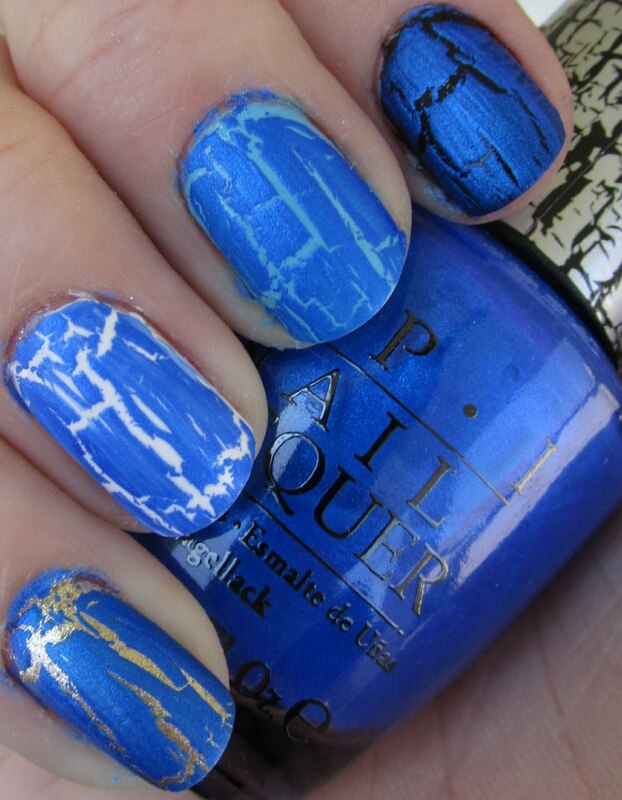 Today I have for you all the OPI Blue Shatter collection, which features three shades of blue in OPI's awesome shatter formula! I will showcase each polish on four basic colors to give you an idea on how it looks on a variety of bases. You will see black (Sally Hansen Black Out), white (Sally Hansen White On), gold (Nicole by OPI Not a Gold Bigger) and light blue (Nicole by OPI Baby Blue). Polishes shown without topcoat. This is definitely my favorite of the three. Not only is this one of my favorite colors ever, this shatter polish also has a little bit o shimmer to it that makes it really stand out! Click to see the shimmer details. 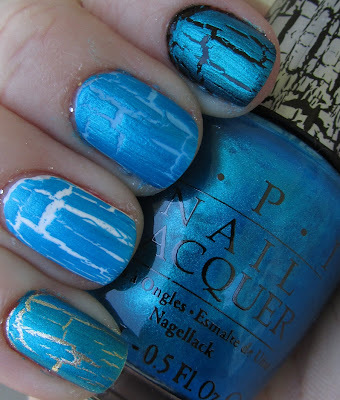 While this kind of washed out over the baby blue, it looked great with the other three colors. I think my favorite combo on this one is black! Gorgeous royal blue shatter that looked great over all four of my test colors. Hard to pick a favorite combo here, but I really like the white and the gold... and the blue and the black, haha. Hard to pick. Very pretty color! 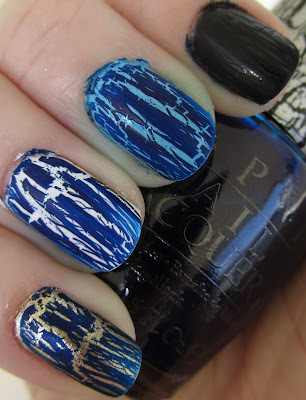 Okay, I had some problems with navy shatter and I am not sure why. See how it looks kind of stringy and streaky? I did this three times and each time this happened, even though I put it on quickly (I know that taking too long can make it streak like this). However I have seen a lot of people did not have this problem... bad bottle perhaps? At any rate, it is a really nice color even with some application issues and I will give it a go again in the future. Lovely over all test colors besides black (doesn't show up), but I love the gold and the blue the best I think. Any ideas on application? come and vote in the contest on my blog, there's a chance to win a lip gloss.